Domestic violence is the leading cause of homicide here in Maine. An estimated 60,000 women are abused annually. It’s not something we talk about a lot, but it’s a problem. So, when a company like Northeast Security Systems makes a donation of 4 personal alarm units to two small counties in Maine to help fight domestic abuse, it’s a big deal. The Wiscasset-based company donated systems to Lincoln and Sagadahoc Counties. The initiative was initially started by Brodie Hinckley, director of the Sacadahoc County Communicatoins Center. After a meeting with Brodie and Steve Edmondson, Domestic Violence Investigator for Sagadahoc County, Kate Schleh knew what her company should do. Kate, a field representative for Northeast, is familiar with the medical emergency consoles used for the elderly and knew the systems could be used for domestic violence systems as well. They donated the 4 systems, two to each county, and will continue to monitor the systems for free. The beauty of these units is that they look like your typical answering machine. 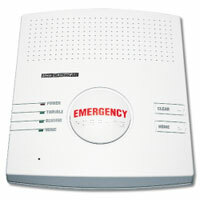 An alarm can be activated through a mobile remote or by hitting a button on the unit itself. The alarm, itself, is hidden to help prevent it being from found and dismantled. Those on the other end of the alarm know exactly what the call is when they hear it. It’s another tool for someone who may be a victim of domestic violence. And with so many incidents that go unreported, these alarms could save lives. In fact, Kate is hopeful that Northeast Security Systems can do more to help combat domestic violence moving forward. The company is looking into a new medical emergency system, expanding to other counties and the possibility of donating returned systems that were previously leased. A refreshing way for a company to look at how their products can make a big impact on their community.